Hello foodies! Thank you for inviting me into your food/beer/wine loving homes. And what is the best way to start my wine blogging debut? 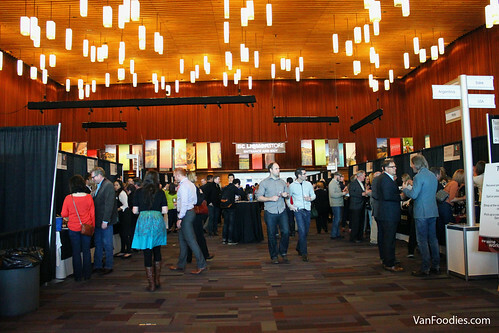 It’s to talk to you about the 37th Annual Vancouver International Wine Festival of course! 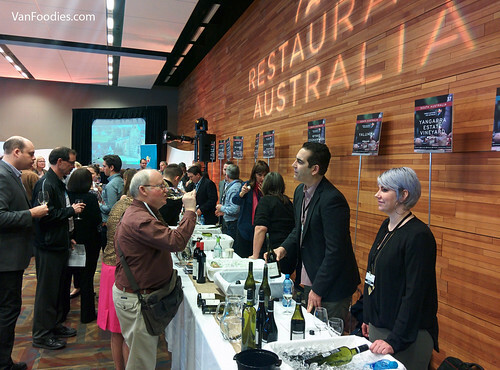 Joyce and I attended the Restaurant Australia and International Festival Tasting events together. 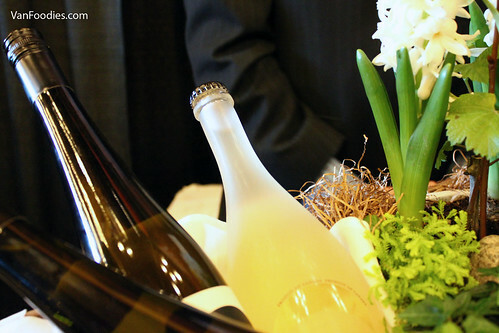 What terrific events full of food and wine to tantalize and quench anyone’s craving for flavour and variety. I will leave the food portion to Joyce (needless to say I enjoyed the food) and focus on the wines of the day. 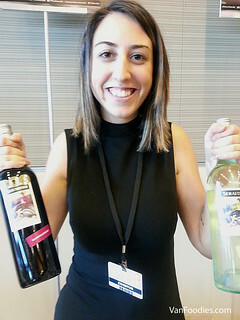 The first event, Restaurant Australia, wet the whistle and eased us into the day by pairing food with wine for 2.5 hours. 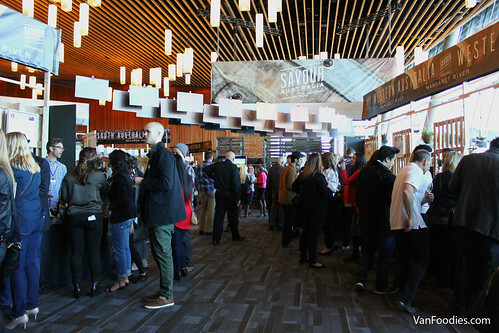 It was then followed by the 2-hour afternoon International Festival Tasting – such a short time to give the tasting room, filled with 170 wineries, justice! However, I sacrificed myself and tried as many wines as possible so I could share some tasting notes plus provide you with some behind-the-scenes information that perhaps you can’t just read on a wine label or website. Firstly, if you are not a fan of the herbaceous or mineral flavours that Sauvignon Blanc usually provides, then do I have a Sauv Blanc for you! 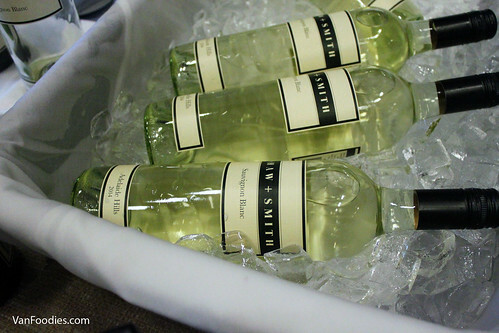 It’s the Shaw + Smith Sauvignon Blanc 2014 with a surprisingly fruity finish without the grassy flavour. 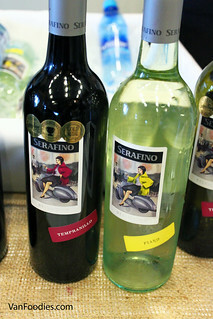 The Serafino Bellissimo Fiano is an Italian white grape variety. An interesting story for Canucks fans – we met the Marketing and Publications coordinator for Serafino, Jessica Luongo, whose company name is Burrows, Luongo & Associates and her grandfather used to be the equipment manager with the Vancouver Canucks in the 1980s. I have never seen a bottle cap on a wine bottle before so it was different to see one on the 8th Generation Vineyard Integrity Frizzante. And this white bubbly tasted really nice too! 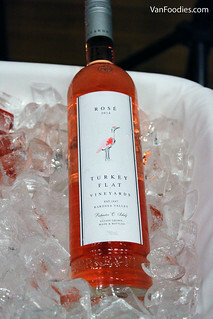 The Wirra Wirra’s Mrs Wigley Rose and Turkey Flat Rose (TFR) are both Grenache-dominant Rose, both had 7 hours of skin contact (for colour extraction and some flavour), however the colour was significantly lighter for the TFR. Also, the residual sugar for the TFR was 2.8g whereas Mrs Wigley Rose was about 4g, yet TFR tasted a little sweeter. It just goes to show that some wines are not black and white and can have many layers, complexities and dimensions. And, with Australia being the feature country for the wine festival, how can I pass up a few Shiraz tastings? 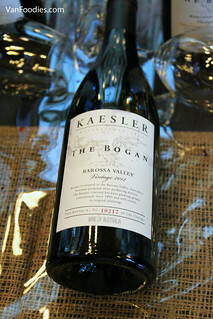 I am from Australia, which has only been an independent country for 114 years, so I found it exciting that we have a winery, Kaesler, that has a 118-year-old vine that produced the “The Bogan” Shiraz 2012. Funny enough, in Australia, we call someone a “bogan” if they are a lesser-class but there is nothing unclassy about this wine. And if you are into a Shiraz that is lighter on the pepper and tannins why not have a go at the Wakefield Wines Jaraman Shiraz 2013. 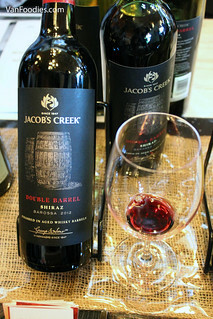 I also discovered a wine that was aged in Scotch whisky barrels – Jacob’s Creek Double Barrel Shiraz 2012. It was off-dry and smooth but I was hoping to get more of a whisky flavour so I may just have to try this one again with a “fresh” palate. 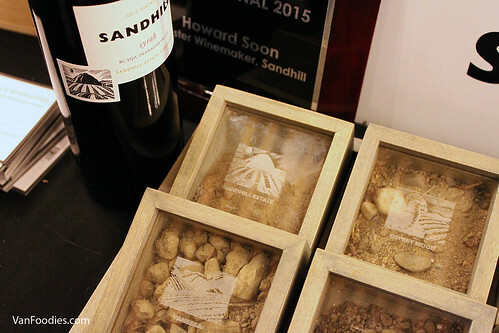 Sandhill Wines has incorporated an informative labelling technique – they show a drawing on the label representing the vineyard where the grapes were grown to produce that bottle of wine. Each vineyard has different characteristics to produce different outcomes in the wines (e.g. more rocky soil for better drainage for those vines that don’t enjoy wet feet). Overall I tried over 40 wines in 4.5 hours and I felt that my palate stood up to the test relatively well compared to other wine tasting event I went last year. So I will leave you with this tip that I have learned the hard way over the years – if you intend to taste a lot of wines in a short time, it is best to not drink the entire glass or sample. As difficult as it is to discard a perfectly good wine, I suggest saving drinking the full samples for those wines that are your absolute favourites.